In this installment: 4-seed Indiana (27-8) vs. 1-seed Kentucky (34-2). Tom Crean has done a brilliant job in his fourth season at Indiana, and will be trying to reach the Final Four for the second time in his career (Marquette, 2003). This year’s team bears more than a passing similarity to the Hoosier team that made a championship game run in 2002, as documented here three weeks ago. Overall, Crean has a .590 career winning percentage and 245 wins in 13 seasons at Marquette and Indiana. Not a bad résumé. Also, Wikipedia says he’s charming. Of course, his opponent here is John Calipari, the man who recently earned his 500th win in Division I. The exploits of Cal are well-documented; two Final Fours, both vacated, a Mario Chalmers 3 away from a national title at Memphis, 12 regular-season championships, 11 conference tournament championships, and, for whatever it’s worth, an NIT title. I bet that one’s at the back of the trophy case. Blue Wildcats against red Hoosiers. Tough call, except when you think about it, it’s kind of lame to name a team after yourself. A Hoosier is just somebody who lives in the state of Indiana. It’d be like a New York City team having a nickname like “Metropolitans” or “Yankees” or something. Nicknames are meant to evoke some symbol whose spirit defines the team. Give me an angry, vicious Wildcat any day of the week. Well, look, we know Kentucky’s going to win this one, too. Calipari has assembled his usual platoon of superlative talent, and the only other team that may be able to compare is North Carolina. Anthony Davis is the star of the bunch, the likely player of the year and a defensive star exceeding even the great Tar Heel John Henson. He’s the leading scorer with 14.3 points, 10.1 boards, and 4.6 blocks per game. Doron Lamb, who shoots 47 percent from beyond the arc, is next with 13.4, and the moody Terrence Jones is close behind with 12.6 points and 7.6 boards. Pretty sweet, right? Oh, but wait. Then there’s Michael Kidd-Gilchrist, the phenomenal guard who scores 11.5, and point guard Marquis Teague, who dishes out nearly five assists per game, and, just for good measure, Darius Miller, another very good 3-point shooter whose 9.8 points off the bench are the sixth lethal weapon at Calipari’s disposal. What’s really frightening about Kentucky is that any player can emerge in any given game. The win against Iowa State in the Round of 32 is a perfect example. Teague had 24 points and seven assists, Lamb nailed five 3s, and Miller came off the bench to hit for 19. Again, these are scorers four through six. It’s completely unfair. Victor Oladipo doesn’t share their skill from downtown, but he’s excellent at penetrating and scoring off the drive. He draws defenses in with his quickness, and that frees up perimeter space for the shooters. The fifth starter, Will Sheehey, is a 6-foot-6 sophomore who helps on the glass and hit the game-winning shot against VCU in the second round. Unfortunately for the Hoosiers, they lost reliable senior point guard Verdell Jones III for the season with an ACL tear earlier this month, and have had to rely on untested guards like Matt Roth and Remy Abell to fill the gap. I can’t stress enough that this is a terrible, terrible matchup for Kentucky. Indiana won the first game between the two largely because they shot 9-for-15 from 3 (60 percent), and there’s no reason that feat can’t be duplicated. Wisconsin’s close call against Syracuse is another blueprint; make a ton of 3s, keep the game at a measured pace, and hope for some luck at the end. Granted, Syracuse played a zone and conceded more open shots than Kentucky will, but Indiana is also more athletic than Wisconsin and capable of excelling in multiple dimensions. The most important stat is this: Indiana has the second-highest 3-point shooting percentage in the country (43.7, behind only Northern Colorado). That’s what makes them so terrifying to face in March. Add in guys like Zeller and Oladipo, who bring elements to the game that produce points and result in more open looks for the shooters, and you’re dealing with a nightmare opponent. This might be the only kind of team who can actually beat Kentucky in the rest of the tournament, and it’s bad luck for the Wildcats that they drew them in the Sweet 16. That being said, let’s not get carried away. 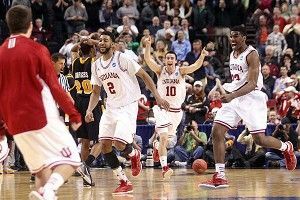 Indiana’s defense is only modestly efficient, and there’s nothing on that end that they do particularly well. Kentucky does everything well, on both ends; the Wildcats hold opponents to the lowest effective field goal percentage in the country, they block the most shots, they never allow other teams to reach the line, and they boast the second-most efficient offense in Division I. That’s what happens when you have six amazing players on the same team and a coach used to dealing with a lot of talent. Yes, Indiana is one of two teams to actually beat Kentucky this season, but we shouldn’t forget that it happened in Assembly Hall in front of a rabid home crowd. Even in those favorable circumstances, Kentucky still showed composure in climbing back from a late deficit, and Watford had to hit his buzzer-beater to avoid a rough loss. The usual knocks on Kentucky — especially youth and lack of 3-point shooting ability — are no longer valid on this year’s team. Calipari has a group that should win the national title. If they don’t, it will either be because they lost a fluky game, or they met Ohio State, Syracuse, or North Carolina in the championship. But the Hoosiers’ unique weapons, especially 3-point shooting ability, give them a puncher’s chance to be the fluky team that upsets the juggernaut. For that, they get the style point. It’s been a whole season of nonstop momentum for Kentucky, but that took a hit when they lost to Vanderbilt in the SEC championship game. Still, the Cats are playing like nobody can touch them, and Calipari, who has progressed from Elite Eight to Final Four over the last two seasons, should take the logical next step in 2012. The Hoosiers had a great end-of-season five-game winning streak, beating Michigan State and Purdue along the way, but that came to a halt with Jones’s injury. In the first game after he went down, they lost to Wisconsin by eight. Their tournament form has been decent, but they barely survived a scare from the pressure defense of VCU in the last round. We’re still not quite sure what this team looks like without Jones, or how much the transition has hurt. Again, edge to Kentucky. Despite the 6-1 score thus far, there’s no reason Indiana fans shouldn’t go into this game with faith. A great shooting performance is not out of the question, and Kentucky could go cold. If I were a Hoosier fan, I’d actually be pretty excited to see Zeller take his licks against Davis and to watch Hulls and Watford bomb away. But based on the track record of both teams, Jones’s late injury, and the absurd quality of Kentucky’s individual talent, you’d be a fool to pick anyone but the Cats.